After a couple of days away from my Retrochallenge, I decided to dive back into trying to get that damn Z80 CPU to listen to me from MS-DOS. A few days back, I actually stopped in frustration when I realized that I would definitely need to do some x86 assembly language programming to get things moving forwards. The page outlined the values for the registers of the 8088 when trying to pass arbitrary code to the Z80. 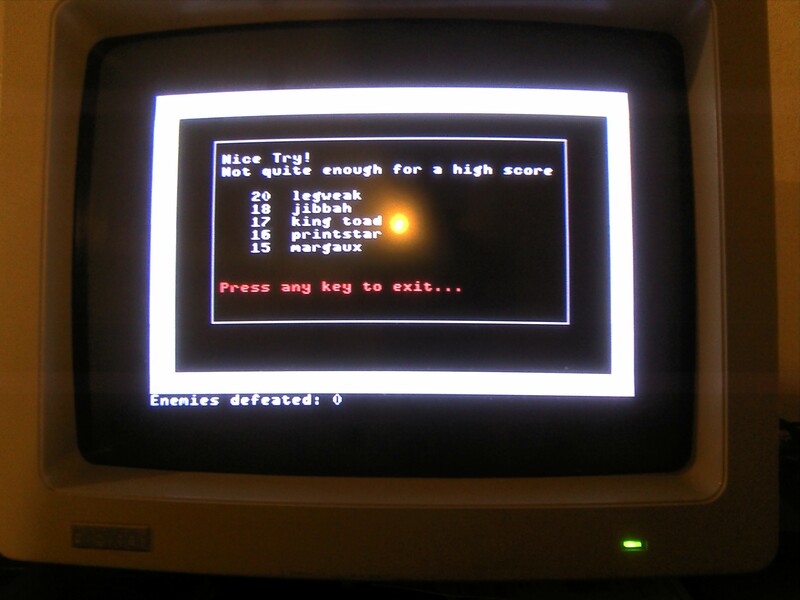 To be honest, I have some serious doubts about the above scheme working when in MS-DOS; I can’t seem to see where anything similar is done in the MS-DOS BIOS code to trigger the Z80 to perform disk access. There is a good chance that the CP/M BIOS is performing some extra work behind the scenes after the above call is made. However, the method above is easy enough to try. I foolishly assumed, though, that I would be able to first set the values of the 8088 registers and then signal the 8088 output port from C. This idea is, of course, nonsense because C is too “high-level” to hope that any particular register would persist between being set and my calling a C outport() function. I needed to use assembly, which annoyed me enough to stop for a bit. For an assembler, things became a bit trickier. I do also have Turbo Assembler, but, when I ran it yesterday, I found that it did not work on the Rainbow at all. It wouldn’t even run under Code Blue. And why is doesn’t it work? Borland is mildly famous in DEC Rainbow circles (is that a thing?) for being complete jerks. Borland produced a number of compilers and applications for the Rainbow as native programs, both under MS-DOS and CP/M. However, when Turbo C 2.0 was released, things went bad. Rainbow users who bough the software were horrified to find that this “MS-DOS compatible” compiler didn’t run at all, while previous versions ran just fine. Borland was completely silent on the issue, too. One enterprising Rainbow user was able to determine what was actually happening. Internally, the Borland compilers were unexpectedly using MS-DOS interrupt 0×18. This interrupt is relatively harmless on an IBM PC, but it is used for communications ports on a Rainbow. There was no reason for Borland to choose 0×18 in the first place; it is entirely arbitrary, which makes Borland’s choice so frustrating. This helpful Rainbow user, though, was able to generate a set of patches for the Turbo C executables, the compiler and preprocessor specifically, that changed their internal interrupt calls to use 0×60 instead. The same user went on to generate patches for a number of other Borland tools as they continued to use interrupt 0×18 all over their development tools, including Turbo Assembler..
My copy of Turbo C is obviously already patched. However, I never did take the time to patch Turbo Assembler, apparently. Additionally, I have no hard-copy documentation for any Borland tools. The unpatched assembler and the lack of immediately available documentation convinced me that it was time to move on to Microsoft’s tooling. The transfer of MASM to the Rainbow was simple and fast. Although the archive was about 680KB in size, it goes relatively fast transferring it from a GNU/Linux server via ZModem at 19200 bps. On the other hand, my stripped-down MSC 5.1 distribution, weighing in at about 900KB, was sitting on another Rainbow with a notoriously (in my house) slow hard disk. I couldn’t transfer between the two Rainbows using ZModem because the receiving Rainbow would time out prior to the “slow hard disk” Rainbow even accessing the file to transfer. Whenever serial transfers become problematic, it’s time to pull out old, slow, and reliable Kermit. If ZModem were a sports car, Kermit would be a car that won’t start and is being pushed manually up a steep hill. In contrast, though, Kermit provides drastically more reliable error checking than ZModem to the point of overkill. Back in the BBS days, I rarely had any issues with ZModem, but occasionally the speed of disks can become an issue, requiring a slower transfer rate. I started the transfer and left the two Rainbows to talk it out. In summary, I now have a fully function Microsoft C and MASM environment all set up and functioning. Hopefully I can get on with my work. I started today’s Retrochallenge work by trying to hunt down exactly how to trigger the Z80 to execute code. Unsurprisingly, the Rainbow’s MS-DOS technical documentation doesn’t actually provide an answer to this question directly. Because the Rainbow’s MS-DOS BIOS only employs the Z80 for disk access, there would be no “practical” reason to do so otherwise. The interrupt tables also suggest this inability to access the Z80. The only interrupts available that appear to do anything similar are actually “Interrupt from the Z80A,” rather than asking the Z80 to do work. So where to go now? Digital’s Technical Documentation for the Rainbow is an odd collection of massive binders containing a plethora of both useless, high-level information (“Available Peripherals: Keyboard…”) and low-level gems (the video memory’s linked-list layout and scrolling via changing pointers alone). It also, oddly enough, contains the complete Microsoft Macro Assembler source code for its MS-DOS BIOS. That’s right, Digital provided every last line of source code for their BIOS. I’m not any sort of assembly language expert, but I can usually stumble through the code. It appears, though, that simply pushing some data OUT to port 0 (the value of intz80) on the 8088, causing the Z80 to begin execution of code. There is obviously some work to be done setting up what exactly the Z80 should be doing, but it appears that the process is rather straightforward. The 8088 then sits in a waiting loop checking to see if the Z80 is done. I’d rather like to avoid writing assembly language code for this challenge with the exception, possibly, of some Z80 assembly. Peeking through Turbo C and Microsoft C headers, I ran across “outport” and “outp” respectively (MSVC still supports outp…). These should allow me to fire off requests to the Z80 from C hopefully, but we’ll have to see. As an aside, I’ll try to post any images to my SDF Gallery account for all to see and enjoy. Some Twitter pictures might take a few days to show up, but I’ll do my best to consolidate everything. This summer I’ve once again decided to waste some time participate in another Retrochallenge! I do love entering these contests because it gives me an excuse to spend some quality time with my favorite machines. Unsurprisingly, I’ve decided once again to focus on my Rainbow 100 (or 190 depending on the day of the week). It’s clear that the Z80 wasn’t given all that much responsibility in the system. However, the Rainbow had reasonably good floppy disk access speed thanks to the Z80. The Rainbow also featured a version of CP/M called CP/M-86/80 that had the fascinating ability to detect if the executable was a Z80 or 8088 program and execute it on the proper CPU. This feature allowed the Rainbow to run either legacy CP/M-80 8-bit code or newer CP/M-86 16-bit code. One interesting detail about the design is that, outside of floppy access, the CPUs’ control over shared memory was relatively fine-grained. There were systems built in to make sure that only the 8088 or Z80 was accessing the shared RAM at any given time, but each could go about running programs “simultaneously” as long as this conflict didn’t occur. The manuals, though, do refer to the CPUs as “master” and “slave,” explaining that the Z80 and 8088 didn’t normally (or possibly ever) go about their business simultaneously. It would appear that one would normally wait while the other would do work. Anyways, the Rainbow’s CP/M BIOS provides a pretty easy method for communicating with the Z80 via 8088 interrupt 39. From that interrupt, one can actually tell the Z80 to begin executing code at a specific memory address. Doing this from MS-DOS, however, is a bit less documented. Of course MS-DOS does speak with the Z80 because it requires floppy disk access. There is some communication going on between the two. The real question is whether arbitrary code can be executed, not just floppy disk requests. Why would anyone want to execute Z80 code from MS-DOS? Firstly, I’m not a huge fan of CP/M simply because it doesn’t support subdirectories. When you’re working on a hard disk, CP/M gets old fast. Secondly, most software I enjoy on the Rainbow runs under MS-DOS anyway. I am a nut for my favorite editor, SEDT, which might be the only editor I ever bothered learning all the hotkeys for. I still prefer Select as a word processor over most any others (although Select is available under CP/M as well, I believe). BinkleyTerm is possibly the best terminal emulator ever created even if it was primarily designed to be a BBS front-end mailer. Finally, I’d really love to see code executed on the Z80 and 8088 in a truly simultaneous fashion. Be able to execute code on both CPUs at the same time would have wild consequences, including drastically improving performance in some situations. It would also be an odd multiprocessing use, at least in todays terms, just because the CPUs are different architectures entirely. This month has been quite trying, not in the Retrochallenge sense, but with both work and personal issues. Nevertheless, I did meet my Retrochallenge goal of actually writing some delightful GW-BASIC source code. After a long departure into writing a completely unusable text-mode game, I was able to build a workable game using GW-BASIC and the Rainbow 100′s Graphics Option. I’m quite proud of two minor aspects of the game. First, the three sprites need to be drawn and copied into BASIC arrays right off the bat. This is done on the title screen. The game first displays the text you see in the first screenshot. However, after the text is displayed, it proceeds to draw a small happy face (the player in this game) in the upper right corner, then abruptly delete it. Similar subtle drawing operations are then done for the robot and the bullet. After the three sprites are captured, the “Press any key…” operation is actually handled. Second, I like that the sort routine for the high scores list actually works. It took some thinking on my part to figure out how best to insert a new high score in the proper position, but I figured it out eventually. It isn’t hard, it’s just a bit more complicated when dealing with FOR loops, GOTOs, and arrays rather than stacks. I’m very pleased that it is handled in-place (no secondary array or anything) and it’s written out when appropriate. This silly little game is written in GW-BASIC, so it should work on a PC as well. The only things that would need to change are some assumptions about the screen resolution (the Rainbow has slightly higher resolution than a CGA card). Additionally, GW-BASIC is “portable,” so this program should run in QBASIC as well. 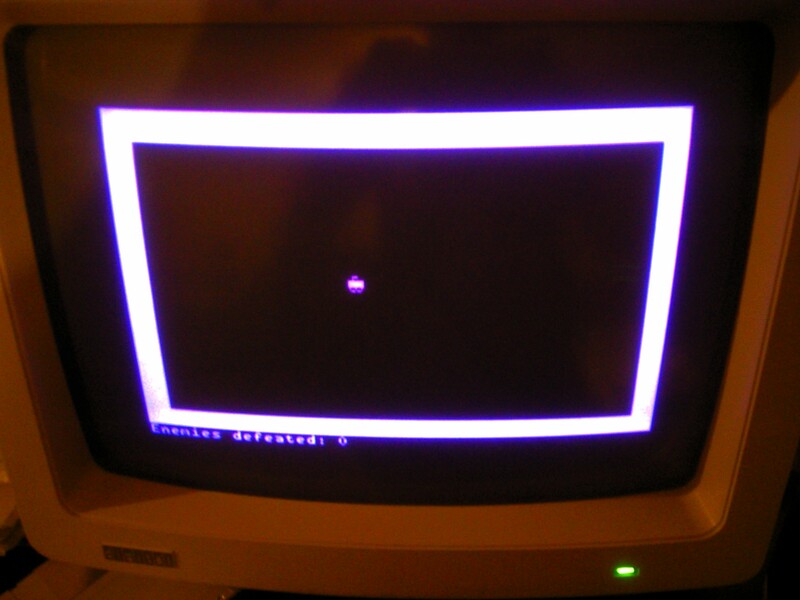 If you do have QBASIC, everything should work fine if you simply change the screen mode to something very hi-res (it’ll look a little wierd, that’s all). The game is kinda fun to play. The enemy robots get progressively faster as you kill more of them. There is little to no safety checking code for creating enemy robots, so you could very well have one appear directly on top of you, causing you to lose instantly. It’s a minor “bug.” The bullets are infuriatingly slow, but that’s how I wanted them to behave. All in all, I’d call this Retrochallenge a success! A game was actually finished in GW-BASIC, and I wrote a cool version control tool along the way (which I used the whole time, by the way). There is currently a bug in Prism, though, that causes the diff operation to output garbage on the Rainbow. 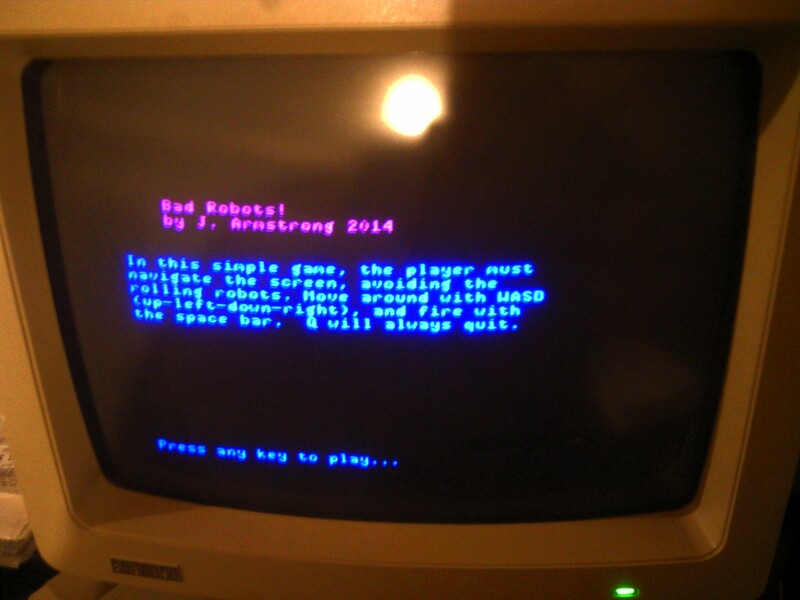 It works on DOSBox, so I probably did something bad with a memory pointer somewhere. Now that it’s over, I do wish I could have done more for this Retrochallenge. However, just because January is over doesn’t mean I can’t continue to hack on the ‘bow! I’ve been truly ignoring my Retrochallenge responsibilities this month, so I sat down to spend some time with my Rainbow 100 today. Before calling it quits completely (I don’t feel like writing Berzerk in C…), I thought I’d try moving a character around the screen using GW-BASIC’s graphics commands. I had originally dismissed this idea for two very good reasons. First, because the Rainbow was historically known for rapid text routines (faster than the PC even), I was sure they’d be fast enough. Second, the Rainbow’s graphics routines tend to be slow. When I last reported on my text-only zombie/Berzerk game, I said that the GW-BASIC interpreter, even with some optimizations, was way too slow to handle it. The Rainbow would have no problem with it, but the interpreter and all it’s collision checking and key capturing just couldn’t do it. On a whim, I decided to implement basically the same code, along with some “lessons learned” like easing off on the GOSUB calls, using GW-BASIC’s GET and PUT commands. This pair can be used to pull off a sprite-like experience using purely BASIC code. These commands work wonders on the IBM PC architecture, where graphics memory is just mapped into the system memory address space. However, the Rainbow has an entirely different architecture. It’s graphics chip, an NEC 7220, sits off the system’s 8088 data bus (the Rainbow actually has two separate data buses, each corresponding to its 8088 and z80 CPUs, but let’s ignore that detail for now) with it’s own memory space. Commands have to be used to copy data from the system memory to graphics memory in a somewhat kludgy way. In addition, copying out of video memory is just as cumbersome. The downside of this memory architecture is that it becomes difficult to store sprites off-screen in a manner that they can be copied to display memory with any sort of reasonable speed. Furthermore, there are maximum sizes of bits that can be copied based on the time available between screen redraws performed by the 7220 graphics display controller. It makes graphics programming on the Rainbow… unpleasant. I originally dismissed any use of graphics routines in GW-BASIC on the Rainbow as possibly far too slow due to this architecture. Furthermore, all that work would need to be done in the confines of the interpreter. The key element in the PUT command is the XOR action verb. This instructs the graphics code to perform an exclusive-or while drawing the data in the array. If the picture is already at that location, it is effectively erased. I then wrote some simple code to allow my control of the “X” on the screen, although this time I stuck to GW-BASIC’s INKEY$ functionality rather than the ON KEY(n) GOSUB … constructs. The INKEY$ function simply returns the last key pressed as a string or an empty string if nothing was pressed. I had a sneaking suspicion that the complicated key capture routines I had used before may have been contributing to speed problems. The only catch is that I now have to use WASD for direction control rather than the arrow keys. When I debugged and ran the code, I was surprised by how quickly everything worked. There didn’t seem to be any problem with speed. The next test was to add one enemy and have it chase me around. After throwing together the necessary code, including creating another “sprite, ” I was shocked to see that everything ran even faster than the equivalent text code! I now suspect that the LOCATE statement in GW-BASIC is the main culprit. There simply isn’t any reason for the graphics version to be faster. Next, I want to get the graphics version up to the point where I had the unresponsive text version. I should have some hacking time tomorrow to give it a shot. It’s been a long time since I’ve posted a Retrochallenge update, and I do have a reasonable explanation for this lack of posts. My silly little GW-BASIC program to move the copyright symbol around the Rainbow’s screen seemed like a good start to a game of some sort. I next added the ability to shoot, basically drawing dashes and pipes when the player hit the space bar. Adding the shooting reminded me of one of the Rainbow’s little oddities. When you hold a key down on the Rainbow, it registers the press once. Then, if the key is still down after 500ms or so, the Rainbow registers this and handles multiple keystrokes. This generally makes sense, but it makes writing a game brutal. There are ways around the behavior; however, it can be disabled (easily) in GW-BASIC. Imagine you want to move left fast on the screen. If you hold the key down, you’ll move left one space, then pause for half a second, and finally continue moving. If someone is chasing you or shooting at you on the screen, the situation is not ideal. Additionally, I did choose to use the ON KEY(x) GOSUB y construct in GW-BASIC. This configuration launches GW-BASIC into subroutine any time the specified key is pressed. My old-time game I wrote as a youngster suffered some serious issues from this construct, mostly because you have to go disabling the key handling before performing collision detection, screen updates, NPC updates, etc. Otherwise, you can end up skipping right out of collision detection and walk through walls. On my “tech demo” here, it meant that, if I held down an arrow, I could move all the way across the screen without the shot I had fired ever moving a single character position. Barring those issues, I decided to proceed with adding an enemy to shoot at. I added a small plus (+) sign that would chase you around the screen in a random fashion. Some simple collision detection would detect if you a) shot the enemy or b) were killed by the enemy. This addition actually worked great! The whole “one enemy” on the screen thing made for an exceptionally boring game. I thought that maybe a Berzerk clone would be fun and possible to play. The next step was to add multiple enemies into the game. I started with a reasonable 8 enemies even though I toyed with the idea of 100 or so to make it a zombie-style game. However, even 8 enemies put an unbelievable strain on the system. Many of the keystrokes were simply lost as the enemies were slowly and visibly updated on the screen during the unresponsive update period. It was completely unusable. I did perform some optimizations to get around unnecessary collision and border checks, which produced a maybe 30% improvement in performance. 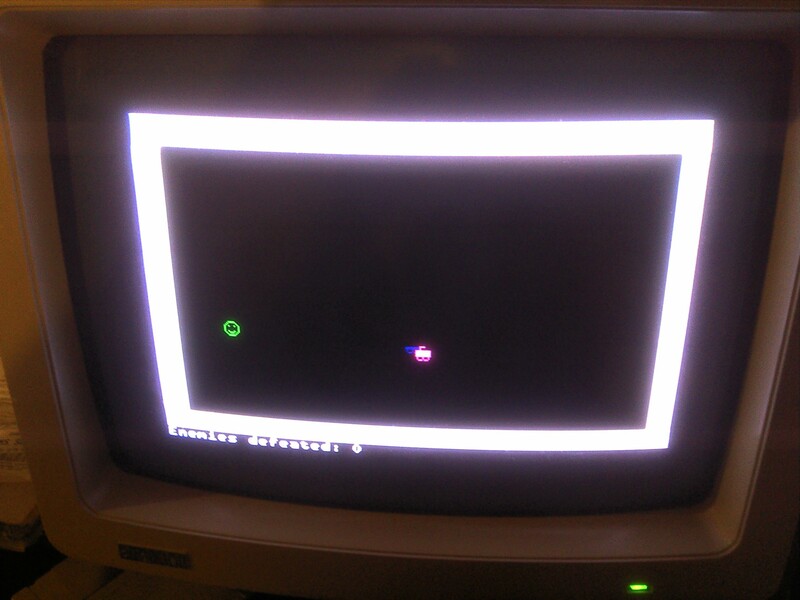 However, the Rainbow’s implementation of GW-BASIC is just too damn slow to run a Berzerk clone. I’m now faced with a quandary. I can proceed with some further GW-BASIC programming, or I could try to see if a Berzerk-style game would work better written in C. I’m not sure yet, but I’ll consider my options. I’ve had a few delays in working on my Retrochallenge project thanks to some software releases for work and playing with my new laptop I purchased Friday. Today, though, I did have some time to spend with my Rainbow 100 and GW-BASIC. Last week I wanted to play with graphics just a bit on the Rainbow in BASIC, but I’ve since forgotten quite a bit of syntax. I decided to do some warm-up exercises. First, I wrote a simple program which performs the simple task of outputting text in different colors. Not very interesting, right? The Rainbow’s architecture is a bit odd in this respect, though. On a PC, I believe, you can output text in multiple colors as long as a Color Graphics Adapter is installed. Things are different on a Rainbow. While my Rainbow does have the Color/Graphics Option installed, you can’t quite do the same thing. The Rainbow’s text output is always generated by chips on the motherboard, and it is always monochrome. If you want to output red text, tough, it isn’t possible. When in text mode, all the text signals are being sent out over the monitor port’s monochrome line, even if you have a color monitor attached (that’s a whole different, wacky story, which we’ll ignore for now). To get colored text, you have to enter a graphics mode and draw text. This procedure in C/Fortran/Pascal/whatever is normally a nightmare; there are no “fonts” built into the graphics hardware. In GW-BASIC, though, the software engineers at DEC were bright enough to notice that nobody was going to use a Rainbow if GW-BASIC couldn’t enter graphics modes and continue to work exactly like a PC would work. Text output works seamlessly under GW-BASIC in either low- or hi-resolution modes. With this epic program created, I decided to give Prism a chance to store it. And did it all work on the Rainbow? You might notice that I’m working from A:. As usual, my 20MB hard drive is completely full, and that free 400KB on a blank floppy sure looks appealing rather than once again cleaning my hard disk. For my next exercise, I wrote a simple GW-BASIC program to try moving a text character around the screen. I don’t think I have it in me to do any graphics during this Retrochallenge. It just becomes so difficult to get running properly. I’m thinking at this point I’ll do some simple text-based game. More to come!